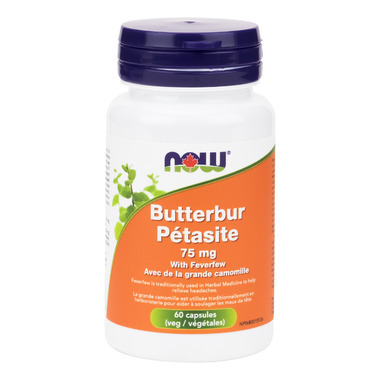 NOW Foods Butterbur Extract With Feverfew Veg Capsules may help to maintain head comfort in healthy individuals. NOW Foods has made this free of undesirable Pyrrolizidine Alkaloids (PA's), so it can be used regularly. European herbalists have been using Butterbur for decades and scientific studies have demonstrated that Petasins, the active constituents in Butterbur, can support healthy blood flow to the brain and promote normal neurological function. Directions: Adult Dosage: Take 1 capsule daily for up to 16 weeks. Use for a minimum of 4-6 weeks to see beneficial effects. Non-Medicinal Ingredients: Veg Capsule (hypromellose, water), Cellulose, Magnesium Stearate (vegetable source), Silica and Stearic Acid. Caution: Consult a health care practitioner prior to use if you are taking blood thinners, if you are breastfeeding or if your symptoms persist or worsen. Do not use if you are pregnant or if you are allergic to plants of the Asteraceae/Compositae/Daisy family. Hypersensitivity/allergy, mouth sores or mouth ulcers and/or gastrointestinal discomfort are known to occur; in which case, discontinue use. If yellowing of the skin or eyes, dark urine, itching of the skin or abdominal pain occurs, discontinue use and consult a health care practitioner. Finally, after a few months this product helped to reduce my migraines! This stuff is fantastic. I have been using NOW's Butterbur w/ Feverfew for about 5 years now... I have hormonal monthly migraines and have found that taking this supplement helps with the severity, frequency and duration of my migraines. In all fairness, sometimes I still doozies of migraines, but this supplement makes such a general difference that I insist on taking it. I do not suffer any physiological discomforts when I take it. I buy this product regularly for my migraines. If I don't take it, they start to get more frequent and worse in intensity. One thing that I've found helpful it to take it with food. If I take it on an empty stomach I feel nauseous. I don't feel constipated like other reviewers have commented, and as long as I take it with food, I don't have stomach problems. I use it to prevent migraine headaches and it really does seem to make a difference in the frequency. Will buy more when I run out. I tried this product for migraine relief for approx. 1 month and in that time did not have any migraines. However, one of the side effects is constipation and/or stomach upset and I suffered both so stopped taking it. I would recommend it only if the positive effects outweigh the negative. I take butterbur with feverfew as part of my migraine-relief regime, along with Magnesium. This combination seems to be helping the quantity and severity of the headaches. Taken at night, it also helps provide a restful sleep. My other review hasn't shown up for some reason so I'll just simply state that this product really worked for my allergies within a week. This product is fantastic. It is the most effective "drug" for my husband's massive allergies in the spring. He used to take a variety of over-the-counter drugs to combat his allergies but now these natural supplements are enough. Amazing! I am totally satisfied with the product and the service of this company. I will be back for sure. I bought this to help with my migraines and so far it has helped; I get them less and they are less intense. It does tale a month for this to work though, so give it time. I'm so happy to be able to find Butterbur again. It's amazing for reducing or stopping my migraines. I also love the free shipping as well.